Are Australian Christians committing the same sort of errors as our American brethren? Lacking the power of the Lordship of Christ many frustrated believers feel like they must do something to be useful to God in the midst of a dramatic decline of national righteousness. The power of the political sphere is the obvious avenue to bring change, even if Jesus’ Lordship operates in an exactly opposite way to the coercive power of legislation. I foresee the Australian Church losing one political battle after another, all the while being distracted away from her chief concern, the abiding life of Christ. What disturbs me about “political Christians” is that their zeal for a cause often comes across as more intense than their passion for the Person of Jesus. Why is this? “And because lawlessness will be increased, the love of many will grow cold. But the one who endures to the end will be saved. And this gospel of the kingdom will be proclaimed throughout the whole world as a testimony to all nations, and then the end will come.” (Matt 24:12). To think that politics shapes culture, rather than the reverse, is back to front. The de-Christianising of the West happened because densely networked anti-Christians took possession of the culture-making institutions of society, particularly higher education and the arts. Despite every good intention the average believer has no access to the more elite “clubs” from which social change is initiated. Unlike, for example, the wealthy, educated, aristocratic group that William Wilberforce drew together, few believers have influence in institutions that re-invent how people see reality. If there is no remedy for moral decline through the political process should we take more radical action? There is another way forward for the re-discipling of our nations but it will require unprecedented humility (Matt 28:18-20). Recently, 14 of Australia’s most senior Church leaders publicly appealed to the PM and Opposition leader to make good on their undertakings to uphold religious freedoms. This political act is as completely unsurprising as it is hypocritical. How often and how loudly have our spiritual leaders been speaking up, inside and outside the Church, for the cause of our persecuted brothers and sisters in other nations? Why should a national Church which has so blatantly sinned against the Lord by failing to pray and advocate for our afflicted brothers and sisters (1 Sam 12:23) expect God to hear appeals for our rights? Do we secretly believe our long Christian history entitle us to some sort of preferential treatment? Perhaps in God’s good purposes we need to be oppressed in order to be revived (Hab 3:2)? Songs sometimes speak of a “near revival”, but is this actually imaginable? The answer is “Yes”, but not in the mode of power many selfish Christians are seeking. 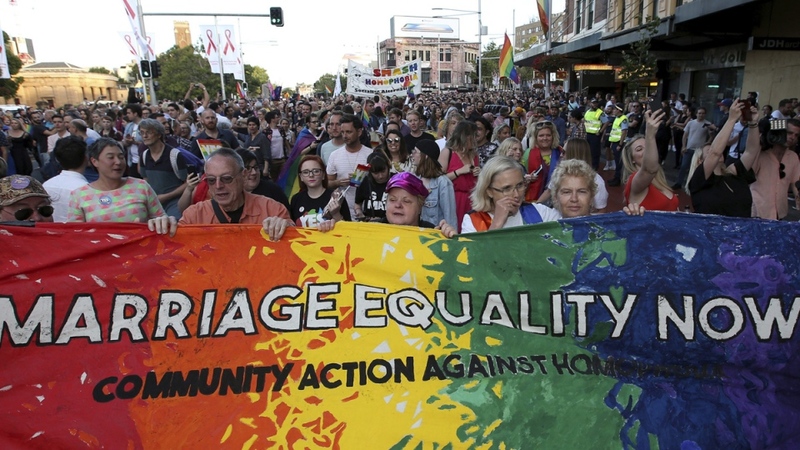 When Hillsong and Sydney Anglicanism put their resources into the “No” campaign against SSM this signalled that political causes have the power to unite polarised Christian traditions. But contemporary Pentecostals and Evangelicals have lost touch with the source of real power. They have drifted far from their roots in great revival movements that transformed the character of Western Christianity. It is idiocy to imagine that the Lord would send revival through the organised Church whilst it has its own elites and clubs who exercise political power inside the churches in a way that does not look like Christ crucified. Institutionalised Christianity can never defeat institutionalised evil. Jesus said to the politically savvy Pilate, “my kingdom is not of this world” and went on to show the true character of the divine rule, by death, resurrection and visiting people with the Spirit of repentance, joy and a radical change of lifestyle (John 18:36; Acts 2:37-47). The mass of comfortable middle class church leaders and their members do not really want to lose control of their life options. There is a market in peddling worldview programmes as a remedy to the spiritual decline of the West, but Jesus is not a set of mental images you can learn, cultivate and studiously apply. The power of the presence of the risen Christ cannot be contained in any wine skin, within or without Christianity. When we are broken enough to accept this and renounce any hope we have placed in politics perhaps the Lord will visit us with his mercy (Luke 1:78). When the Australian Christian Lobby recently called on the “standing army” that had formed to oppose gay marriage to prepare for bigger battles ahead they reinforced the feeling amongst many Christians that something must be done to save Australia. Political engagement however is not the kingdom priority our nation needs if there is to be any remedy for lawlessness in the land. We need the powerful presence of the Jesus in his compassionate wisdom in all the culture making spheres where “Christianity” has been so soundly defeated (Eph 3:10). This does include politics, as well as education, the arts and other dimensions of culture. A Church compromised by political and other powers will never experience the limitless power of God that can change the world. We need to return to be seeking the Holy Spirit power which took hold of our lawlessness and defeated at the cross and went on to raise Jesus in perfect righteousness (Rom 8:11; Heb 9:14). Only by abiding in the life of Christ can there be any transformation of our cultures. This is happened before, and can happen again, but only if we humbly submit to the final reality about divine power; “If Christ is not Lord of all, he is not Lord at all.” May God turn our hearts to Jesus before any other power.